Current orthopaedic tests for rotator cuff pathology and subacromial pain syndrome demonstrate low specificities and inadequate likelihood ratios, cannot isolate individual tendons and other structures to inform an accurate diagnosis and are unable to inform clinical decision making and patient management. The shoulder complex has many peripheral sensory receptors because there is the high sensory control demands and high biomechanical stress. When tissue is damaged the chemical response decreases the threshold of the nociceptors increasing sensitivity. Greater peripheral sensitivity as was as process of central sensitisation explain the poor reliability of shoulder tests. They should therefore be used in conjunction with a full subjective history and objective examination for comparable signs. Described by Jeremy Lewis in 2009 the Shoulder Symptom Modification Tool (SSMP) is a reliable approach to the assessment of individuals with rotator cuff and subacromial pathology. SSMP is a set of four mechanical techniques used in a sequence while the patient performs a movement that reproduces their symptoms. The aim is to identify one or more methods that reduce their symptoms and/or increasing movement and function. 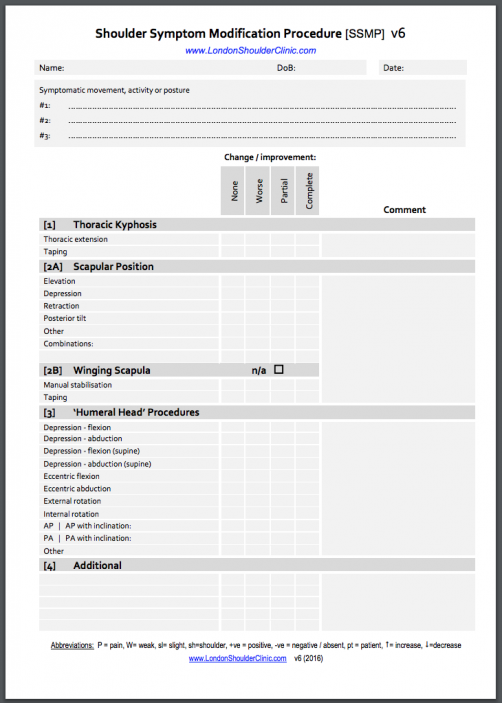 This tool offers a method to objectively assess the shoulder with the focus being to identify movements and techniques that might be contributing factors to the symptomatic movement and not to label the pathology or exact cause of pain and then utilise these movements and techniques as a means to guide treatment. The procedure is described by Lewis et al as follows: the first stage of the SSMP is to identify relevant (typically 1-3) aggravating movements, activities, or postures that reproduce symptoms. Then, as detailed in the image above, a systematic and stepwise algorithm is applied to the aggravating movements, activities, or postures to determine if the symptoms are altered and to what extent. It is difficult to state definitely what alteration in symptoms is clinically meaningful, and the SSMP relies on the patient to make that determination. Patients report what is important to them, such as improvement in movement/function, less pain, reduced paresthesia, or a greater feeling of stability. If an individual expresses that any component of the SSMP has resulted in a meaningful positive change, then the procedure used to produce that change is used to inform treatment. Scapular positioning techniques - If the thoracic procedures do not or only partially alleviate symptoms, then symptom changes secondary to scapular procedures are assessed. Humeral head positioning procedures - If the scapular procedures do not fully alleviate symptoms, the clinician progresses to assess the effects of the humeral head procedures. The purpose of the procedures is to positively influence the patient’s symptoms by applying techniques that aim to depress, elevate, or anteriorly or posteriorly glide the humeral head. Pain and symptom neuromodulation procedure - If the first 3 stages of the SSMP do not completely alleviate or reduce symptoms, then the final stage of the SSMP (neuromodulation) involves assessing the influence of manual procedures, such as pressure-based procedures (aimed at the soft tissues and joints), that may modulate shoulder symptoms and are routinely performed throughout the cervical, thoracic, and shoulder regions. ↑ Lewis JS, Tennent TD. How effective are diagnostic tests for the assessment of rotator cuff disease of the shoulder? In: MacAuley D, Best TM, editors. Evidenced Based Sports Medicine. 2nd ed. London: Blackwell Publishing; 2007. ↑ Struyf F, Lluch E, Falla D, Meeus M, Noten S, Nijs J. Influence of shoulder pain on muscle function: implications for the assessment and therapy of shoulder disorders. European journal of applied physiology. 2015 Feb 1;115(2):225-34. ↑ Lewis JS, McCreesh K, Barratt E, Hegedus EJ, Sim J. Inter-rater Reliability of the Shoulder Symptom Modification Procedure in People with Shoulder Pain. BMJ Open Sport & Exercise Medicine. 2016 Nov 1;2(1):e000181.